Ships from and sold by J.L. Hufford. 8736 Features: -Classic collection. 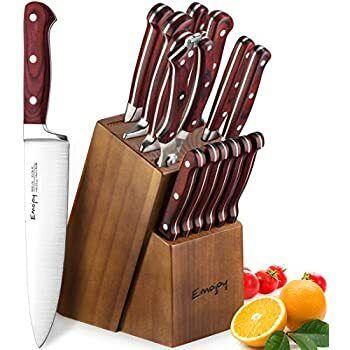 -36 Piece cherry knife block set. 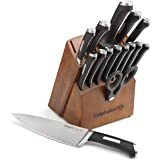 -Set includes 2.75" Peeling Knife, 2.75" Trimming Knife, 3" Serrated Paring Knife, 3" Straight Paring Knife, 3.5" Paring Knife, 4" Paring Knife, 4.5" Utility Knife, 4.5" Cook&rsquo;s Knife, Eight 4.5" Steak Knives, 4.75" Hard Cheese Knife, 5" Boning Knife, 5" Tomato Knife, 5" Soft Cheese Knife, 5" Hollow Edge Santoku, 6" Utility Knife, 6" Cook&rsquo;s Knife, 6" Cleaver, 7" Fillet Knife, 7" Straight Meat Fork, 7" Hollow Edge Santoku, 8" Offset Deli Knife, 8" Bread Knife, 8" Hollow Edge Carving Knife, 8" Cook&rsquo;s Knife, 10" Cook&rsquo;s Knife, 10" Super Slicer, 10" Steel, Come-Apart Kitchen Shears, and 35-Slot Cherry Block. Blade Material: -High carbon stainless steel. Handle Material: -Plastic. Number of Items Included: -36. 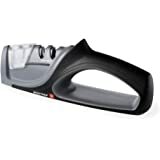 Pieces Included: -Boning knife/Bread knife/Carving fork/Carving knife/Chef's knife/Cleaver/Fillet knife/Kitchen shear/Paring knife/Peeler/Santoku knife/Sharpening steel/Slicing knife/Steak knife/Utility knife. Dimensions: Overall Product Weight: -18 lbs. 5.0 out of 5 starsPerfect performance with beatiful cherry block. Perfect performance with beautiful cherry block to match cabinets. Varied knife sizes I never knew existed but find myself using each specialty knife more and more often. Worth every penny, highly recommend for those that cook, and yes, I would purchase again. 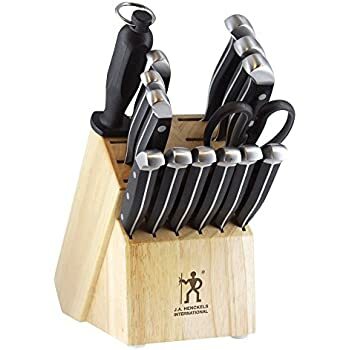 5.0 out of 5 starsThe best knife set money can buy!! As a gourmet chef, I have known about the artistry and excellence that is Wusthof-Trident cutlery. 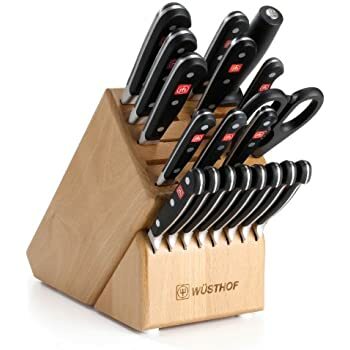 While the company has many different lines of knives, Wusthof Classic is a must-have. Over the years I have accumulated various pieces of Wusthof and honestly could not be happier. 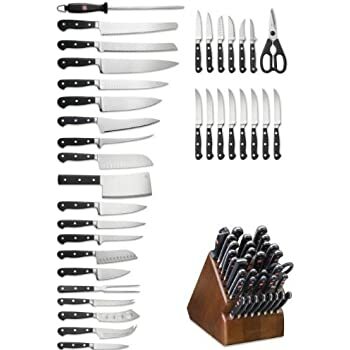 A few months ago I discovered this 36-piece ultimate set and was speechless when it came to the price tag. $2,000 is just crazy for knives but as the saying goes "you get what you pay for", I was certain it is worth it. 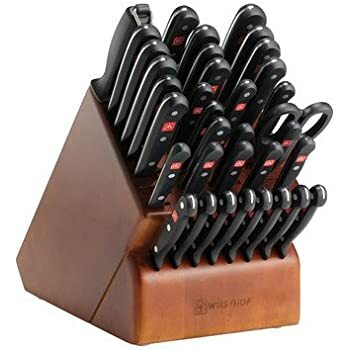 Since I already owned several Wusthof knives I decided I must have this comprehensive knife collection, which possesses every cutting tool one could ever want/need. The only thing holding me back was the price. So over the course of 4 months I saved up and just last week, purchased this set. It arrived yesterday and I couldn't be happier. It is well-worth the money and will indeed last a lifetime. 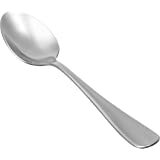 If you are looking for a cutlery set that is all-encompassing and extremely well-made, look no further. Though the block is clearly marked "Made in China", it is of impeccable quality. 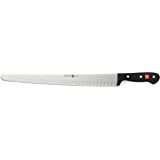 The knives are made in Germany and are a standard in many kitchens, both home and commercial. To protect my investment, I hand wash all my knives in warm, soapy water. It is common knowledge that one should refrain from placing high-quality knives in the dishwasher, since damage can occur to the handles. In all, I say if you want the best set of knives money can buy, get it. You'll be glad you did!! Great value. I was really surprised. When I purchased, I thought they might have priced for Gourmet set instead of Classic set. I definitely didn't receive the Gourmet set. I'm very happy with the set and the deal. Another amazon best buy! 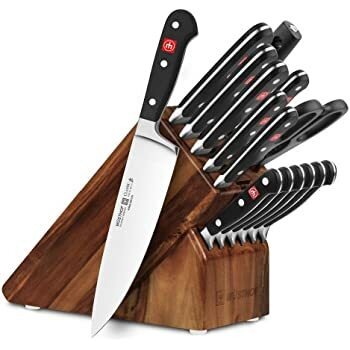 Very well made set of knife block. The block has dent on one side but seller was quick to send a replacement. 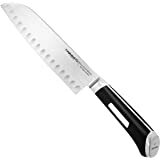 3.0 out of 5 starsGREAT knives BAD price! I bought this set and can't be happier with them. HOWEVER, I paid $1,399! The cost here is outragous. Addition: I bought my set some 10 years ago. I also bought mine at the military store known as AAFES (Army Air Force Exchange Service). Granted, I paid less than if you bought these at your nearest kitchen store, but the price here is still higher than what you can find at other stores that are open to everyone. 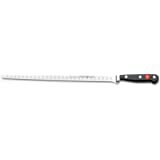 Despite the price, what is the most important factor is the quality of the knives. 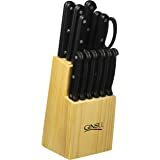 The "Classic" design are great knives and worth the price. Superb. Should have purchased years ago. 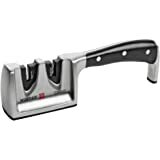 Henkel knives are nice but we like these much better. 5.0 out of 5 starsA Cut Above! 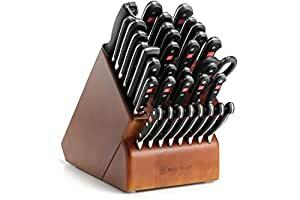 The best knife set I have ever used! The feel of the knives and the superb cutting ability set these far above any other knives I've used. 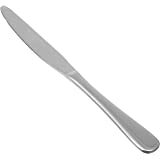 I used to be a butcher, so I know my knives. Great purchase!